Intimate by design, Rosina embodies old school allure and a unique “Champagne Call Button.” There is nothing more glamorous than simply topping off your flute at the touch of a button! 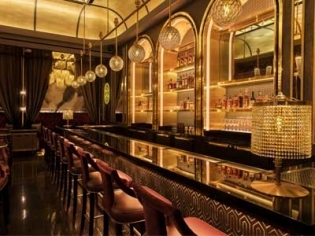 Warmly glowing chandeliers hang above maroon banquettes, burgundy velvet chairs flank high top tables and Art Deco décor embraces you with seductive glamour. The soundtrack to this lavish décor is a sultry mix of jazz, blues and soul. Sit back, relax and sip on your classic cocktail made from the highest quality fresh ingredients. You can have it shaken or stirred or opt for that bubbly with the magic button!